A group of councillors have sought to better understand difficulties people who are blind or partially sighted encounter in Inverness city centre. 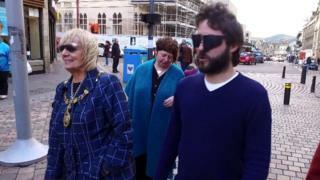 The Highland councillors, who included Inverness' provost Helen Carmichael, wore glasses designed to reduce their visibility while they took a walk. Hazards they encountered included advertising boards, bins and bollards. The charity RNIB Scotland and Inverness Disability Access Panel led Monday lunchtime's initiative. Inverness Disability Access Panel member Roderick Murchison, who has sight loss himself, said: "We know streets can't always be free of clutter. "But we can do more to make them accessible for disabled people. "That's why we are urging Highland Council to sign up to RNIB Scotland's Street Charter that sets out how best to use legislation and monitor compliance." In February, Highland councillors took part in a challenge to use wheelchairs to get around Inverness city centre. Local campaigner Bill Anderson had been calling for access improvements to shops, facilities and at pedestrian crossings on roads.